Cold weather is finally starting to arrive here in Northeast Florida! With that in mind SERVPRO of Putnam County is here with a few tips to keep you and your family safe if you plan on using a space heater to keep your home warm! When selecting your space heater, look for one that automatically shuts off if it gets too hot or if it tips over. These features are really helpful in households where there are active children or pets. When placing your space heater in your home be sure to place it at least three feet away from anything that may be flammable. If anything flammable falls onto the heating element or a hot surface in the heater it will cause a fire. Also do not place the heater in an area that is wet or damp. doing so will increase the risk of electric shock. The safest way to use your space heater is to plug it directly into an outlet. If you must use and extension cord be sure to use one that is properly rated for the heater. Use of an inappropriate extension cord increases the risk of overheating, fire, and electric shock. Never leave a running space heater unattended! Always turn off and unplug the heater when leaving the room or leaving your home! 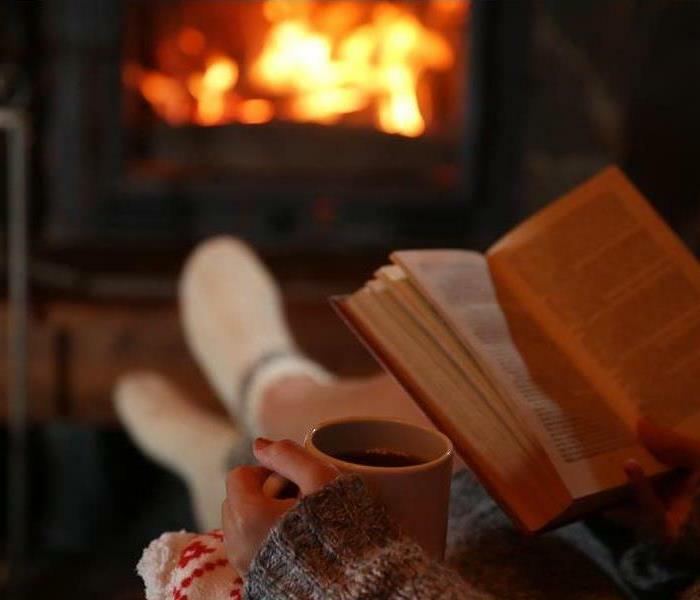 Winter is upon us, so be safe and stay warm! Christmas time is upon us! This means millions of people will not only be decorating the inside of their homes, but also the outside. Here are a few tips to keep you and your home safe. Check the string of lights for cracked cords, frayed ends, or loose connections before you hang the string up. If you have an older string of lights that does not have a fused plug throw them out, and replace them with a newer set of lights. If you need to replace bulbs make sure the replacement bulbs are the correct wattage. Do not hang light with tacks, nails, or screws. These can pierce the wire and cause a shock hazard. Use insulated hooks or plastic light hangers. Elevate the plugs on extension cords to keep them out of the rain. Only use light that are for outdoor use outside. Lights rated for indoor use only are not made to withstand the outdoor elements. Always plug your lights into a GFCI outlet to avoid electric shocks and short circuits. The folks here at SERVPRO of Putnam County want you to stay safe, and we look forward to seeing all your beautiful light displays around Putnam County! Christmas tree are really a thing of beauty! They are wonderful to look at in your home, and they also add their beautiful pine aroma to the air. Real Christmas trees are also a fire hazard that is not to be taken lightly! From 2012-2016 US fire departments responded to an average of 170 home fires that started with Christmas trees per year. These fires caused and average of 4 deaths, 15 injuries, and $12 million in property damage. Follow these safety precautions to make sure your tree is as safe as can be! Always choose the freshest tree you can find. Look for the tree with vibrant, green needles that are hard to pluck. The tree should not be shedding needles readily. Place your tree away from all sources of ignition. Make sure your lights have been tested by UL for safety, and throw any damaged lights away. Keep the tree stand filled with water to help avoid the tree drying out. Always turn the tree lights off when leaving your home and before going to bed. An artificial tree, while it does not provide that wonderful smell, is a great substitute for a real tree that does not have anywhere near the fire hazard potential. Whichever you choose to place in your home the team at SERVPRO of Putnam County want to wish you a safe and merry Christmas! This customer's water heater was way past it's life expectancy when it failed at the cold water inlet. Flooded three rooms before we arrived. You know that one appliance in the home that never crosses your mind until either you don't have hot water, or even worse, you find a puddle of water in the location of your hot water heater. They are out of sight and out of mind; just quietly doing their job while all the other appliances in the house get all the attention and glory. There really is not much to maintaining your water heater, but there are a couple things you can do to make sure you make it through the lifespan of your water heater trouble free. Testing the pressure release valve is very important. This valve releases pressure should your water heater become over pressurized. If the valve is faulty this could cause the water heater to explode violently. Flushing the sediment out of your water heater can help with the efficiency of the water heater and also prevent clogged pipes in your home. If your water heater is electric be sure to wait for the tank to fill back up before turning the power back on. if the tank is not full before power is restored the heating elements will burn out. These couple tips will help insure that your hot water heater will function properly throughout its lifespan. 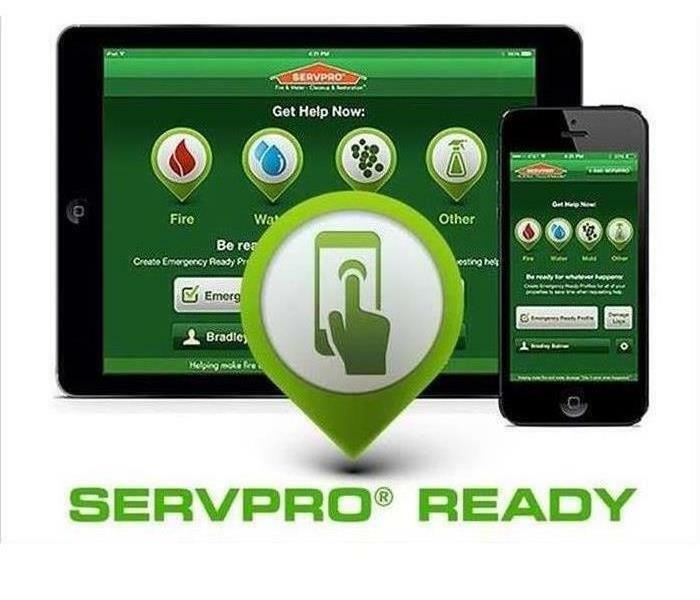 Access your plan with ease with our SERVPRO Emergency Ready Plan app! Do you have a plan for your business if disaster were to strike? If one of your employees came in to open up for the day and there was an inch of water on the floor, would they know what to do? The key to getting back to business as usual after a disaster strikes your business is being prepared! The SERVPRO Emergency Ready Plan is here to help you do just that! The best part is that it is absolutely FREE to you! The SERVPRO Emergency Ready Plan is a plan that one of our experts will come in and put together for you. It will have all emergency contacts listed, all utility shutoff locations will be photographed and tagged, and many more feature to help you in case of an emergency. When your business' plan is complete you will receive your plan in a folder to keep on hand and you can also download an app, so you can access your plan at anytime! Call us today, at 386-328-8660, so we can start your Emergency Ready Plan as soon as possible! Team SERVPRO celebrating with their end of the season bowling party! 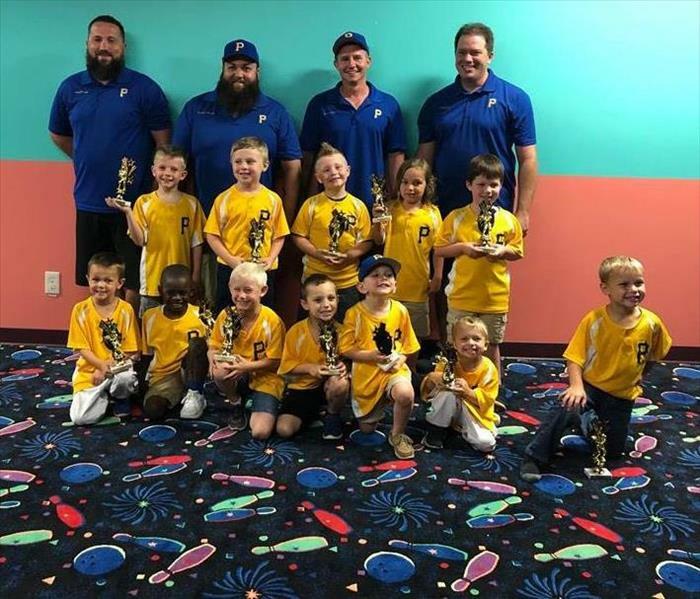 This past spring we once again had the pleasure of sponsoring one of our local t-ball teams. The kids had an excellent season this year! They ended the season in second place with just a couple of losses. This was the third season that we have sponsored the team for this group of kids. It has been so much fun watching the all of them grow, and seeing how much their skills as ballplayers improve. We wish those who move up to the next league the best of luck! Here at SERVPRO of Putnam County we all believe that we need to invest as much as we can into our children. It does not have to be money, you can also volunteer time. Local sports leagues are always looking for volunteers to coach, get fields ready, or just help run the league in general. Our children of today will be running the world of tomorrow, and it is up to us to show them the way! Here is a small example of some of the damage from the past two hurricane seasons. We are now headed into what is historically the most active part of the hurricane season. Over the past two years we have been affected by two hurricanes locally during this part of the season. Now is the time to get everything ready at your home. Get started now preparing a hurricane kit full of supplies. If you have pets make sure they have a fresh supply of food, and extra water for them also. These are just the essentials. You can add any other items that you can think of to fit your personal needs. If you already have an evacuation plan in place things will go much smoother in the event that n evacuation is ordered. You should already have a location in mind that you will head to if there is an evacuation ordered. Make sure that location is not in the same direction that the storm is headed. If you have pets you need to be prepared to either take them with you of find a shelter that is going to stay open during the storm. If you are taking them be sure to bring their food and any medications they may be taking. Be sure to use caution after the storm has moved out of the area. Stay away from downed tress and power lines. If you drive your vehicles watch out for debris in the road. If there was an evacuation ordered, wait for the all clear before you try to get home. It is hard to have to wait and see what the storm has done to your home, but things will move much more smoothly if you wait for the all clear before trying to get home. 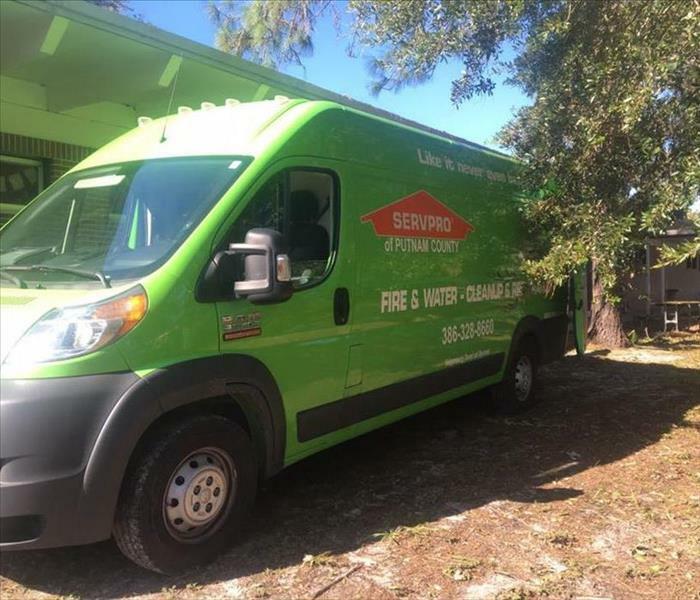 If your home sustained any damage you can call us SERVPRO of Putnam County during and after the storm. We will get to you as soon as it is safe to do so. We will do out best, in your time of need, to make it "Like it never even happened." SERVPRO of Putnam County doing our best to get a local elementary school's library back to the kids after a water damage. Here at SERVPRO of Putnam County we get asked all the time what the most common cause of the water damages we go to. There are actually quite a few answers to this question. You normally only worry about your HVAC system when it stops heating or cooling. 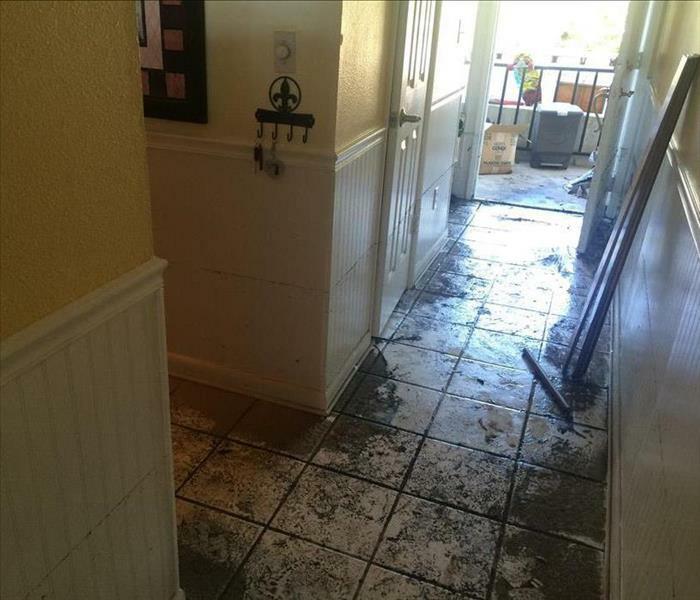 But did you know that your HVAC system can actually flood you entire home? As the unit pulls the moisture out of the home all that moisture has to go somewhere. That somewhere is normally outside the home via the condensate line. If that line is not cleaned out periodically it can and will slowly clog up. Instead of the moisture going out of the house, it will spill out of the drain pan and onto the floor. Hot water heaters, ice maker supply lines, toilet supply lines, and dishwashers are just some of the appliances around your home that can fail at some point. The water will keep running to most of these until you shut the water off, so if you are going out of town it is always a good idea to shut the water off to your home. Toilet flappers failing is another big one. This will cause the toilet to fill with water constantly. Once your septic tank is full from all the water, the water has only one place to go. Into your home! Sewer backups are also more common that you would think. This type of water damage can pose a serious health risk and require a professional to clean it up properly. Roof leaks can caused by an aging roof, storm damage, or even a roofer who is doing work and failed to dry the roof in properly. However it happens sometimes by the time you discover you have a roof leak it has already been going on for some time. If not dealt with in a timely manner a leaky roof can cause your ceiling to fall and harm the structural integrity of your attic space. No matter what the cause of your water damage is SERVPRO of Putnam County is here to help you! Call us 24 hours a day at 386-328-8660, and we will be there to help you in your time of need! When Hurricane Irma came through we started getting calls for cleanup almost as soon as the wind and rain started. Our list grew and it grew quick! Once Irma moved out and we were finally able to make it out on the roads we found out that our office had no electricity. With no phones, internet, or electricity that slowed our response some, but we moved as quick as we could. Irma's damage was completely different from Matthew. Most of the damage from Matthew was from flood waters caused by tidal surge. Irma's damage was mostly from wind driven rains. We worked on the bulk Hurricane Irma's damage from the time it moved out in September until the beginning of December. We are still getting some call form customers about storm damage, but they are people who didn't realize they had damage and they now have a mold problem. Here at SERVPRO of Putnam County it is our privilege to help out in our community and surrounding communities whenever storms roll through! We will always be here to make it, "Like it never even happened." 10/5/2018 - Does Your Business Have a Plan?